This painting was began en plein air (outdoors). 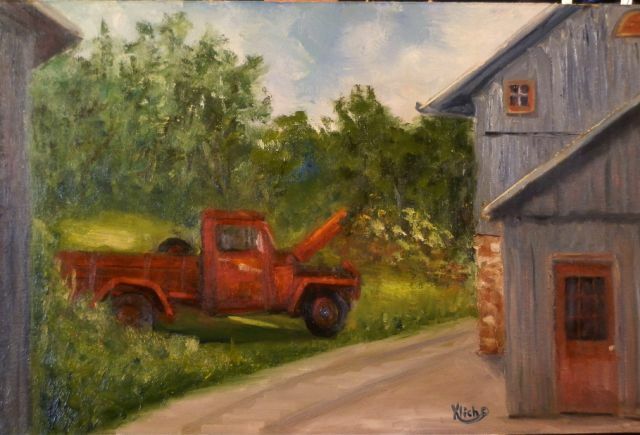 The owner of the old International Truck was ever so accomadating as he charged the battery, got it started and moved it a few feet this way and that, while I tried to decide which placement would look best in my painting. The day was over and I was not finished so I decided to complete the painting on “Painting Journeys”. I also thought it would be nice if the veiwers of my show had a chance to see what the area I live in looks like. This is pretty much a scene right out of our countryside here in Sheboygan County. Many farms, old trucks and really nice people. To view the episode of “Start Er Up” please go to http://www.wscssheboygan.com. Go to Programming, scroll down to VOD (video on demand), select category “Arts, Music & Entertainment” and then scroll the shows for “Painting Journeys” “Start Er Up”, Sheboygan County, WI. It is very hilly in the town of Assisi. Everywhere I went I was either climbing stairs or walking up and down narrow cobblestone streets. Such a lovely little town with the monks walking about in their cassocks and sandals. As I was coming back down the lane I saw this beautiful garden corner. I thought it was so charming that the arrow on the sign pointed in the opposite direction from the garden – or perhaps the joke was on me and a larger garden was just around the corner. The way the mediterranian sun spashed across the building and flowers hanging there was enchanting.